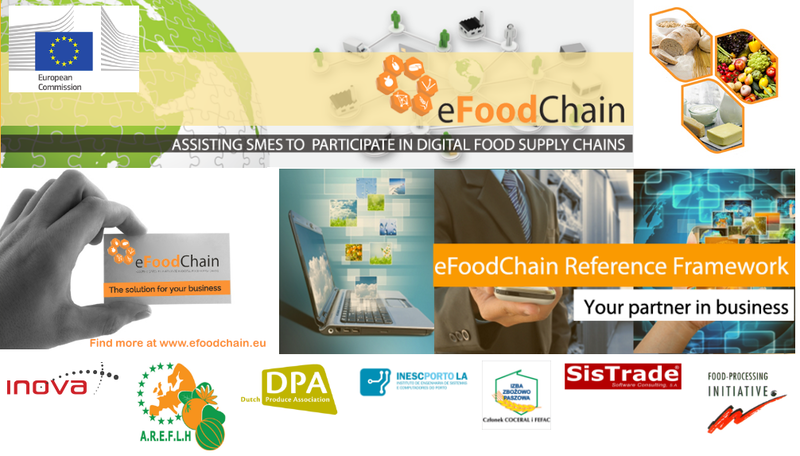 The eFoodChain project developed a collaborative Reference Framework for the digital agro-food supply chain. 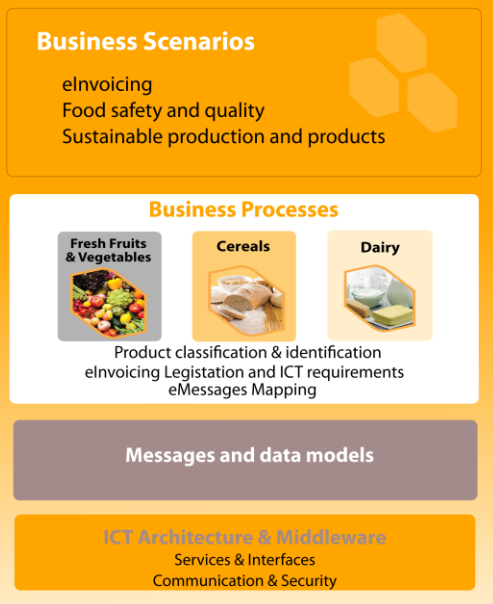 Principles and rules for interoperability among business processes and data exchange models can be adopted by representatives of all levels of the agro-food value chain and IT Providers operating in this sector. “The European Commission [EC] believes that the 'smart' use of information and communication technology (ICT) by companies is a critical factor for success in innovation, competitiveness and growth.” (EC - Digital Economy). “Our plan to help European industry, researchers and public authorities to make the best of the digital transformation has been published.” (EC - Digital Single Market – Digitizing European Industry Standards and Skills). Although there have been significant developments and increased usage of ICT, there is still a great deal of inefficient trends that take place in the supply chain management of almost every economic sector. For example, the “validity and acceptance of data models underpinning business transactions (e-Catalogues, e-Ordering, e-Invoicing, etc.) still follows national rules, making cross-border transactions difficult”. “This results in a fragmented technological outlook, with a multiplicity of incompatible business standards, data models and ICT solutions and with very low interoperability levels, especially across borders”, reflected in security, authenticity and integrity issues. The food-and-agribusiness sector is strongly populated by SMEs (“that represent more than 99% of companies and generate approximately half of the industry turnover”), and plays a substantial role in the global economy. Moreover, it is a significant contributor to social and environmental welfare as well as to employment and growth, since food represents a significant share of households' expenditures. The permanent need for innovation and new information technologies is one of the most important challenges faced by the food-and-agribusiness sector, also for strengthening exchanges with other sectors linked to it. Innovation requires better collaboration between the public and different private business sectors (comprised SMEs), including transport, packaging, retail and business services. 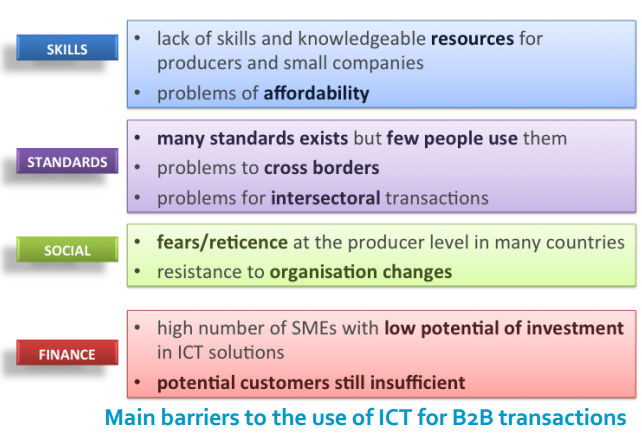 The challenge is how to facilitate, enable and promote a seamless ICT environment and innovative B2B (business-to-business) services underpinning the food supply chain that can help enhance this collaboration. The eFoodChain project - funded (2012-2014) by the European Commission - DG Enterprise & Industry and supported by the eFoodChain consortium - was a response to the aforementioned challenge. and involved various types of agro-food stakeholders (SMEs were at the centre of interest). 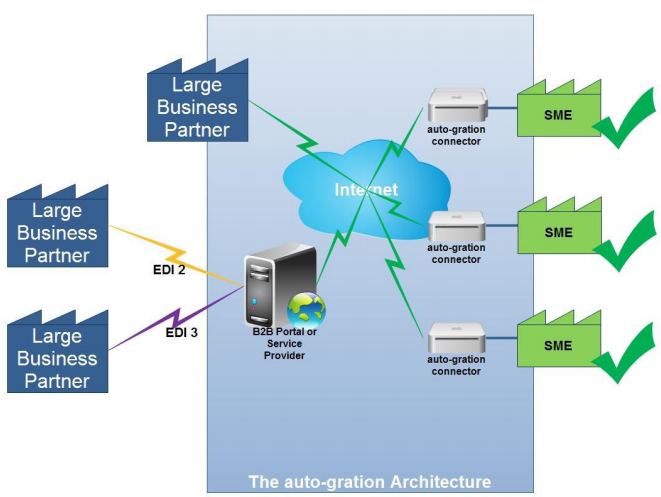 The project identified how to diminish technical and organizational barriers hindering the participation of SMEs in global digital value networks, thus enabling SMEs to become international business partners. 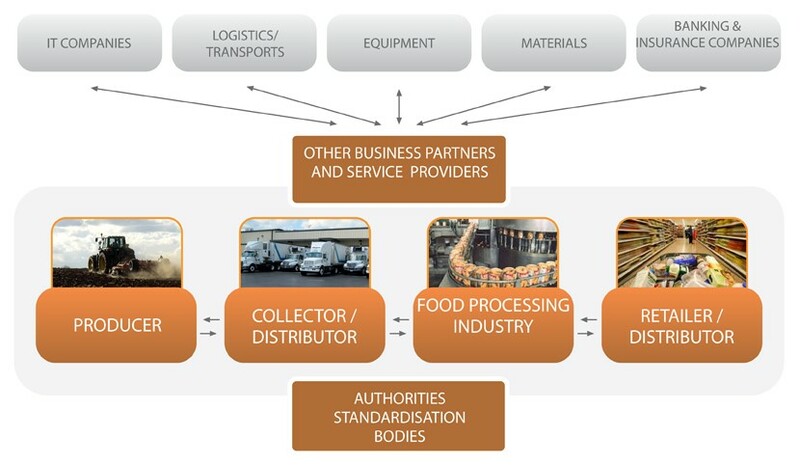 To identify existing gaps that could possibly be addressed during the development of a framework for the digital food supply chain, the project conducted an eFoodChain Market Analysis. “The main conclusions of the Market Analysis highlighted the importance of developing ICT from upstream of the value chain and to pay special attention and focus on business messages and traceability. More importantly, it is essential to use international standards and thus comply with interoperability of the processes. Furthermore, also financial cost for SMEs shall not be ignored, being an important criterion for adoption of any solution” (eFoodChain Newsletter 2012-1). 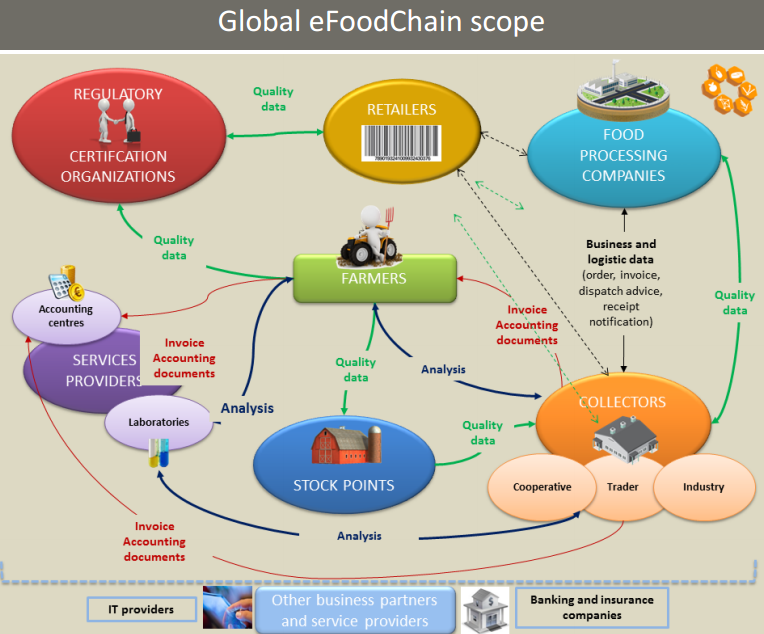 The eFoodChain project makes electronic data exchange easier, more reliable and quicker than the current systems and enhances traceability of food products quality and safety, thus leading to better products and better customer retention rates. The obtained feedback from early adopters has contributed to fine-tuning of the Reference Framework allowing seamless, paperless information flows underpinning B2B transactions along the agro-food supply chain. alignment with the needs of producers to help guarantee that the scale necessary for low costs is reached. The results of the project have promoted the innovation of ICT in the food supply chain, reinforced business relationships between SMEs and larger players across the borders and contributed to the implementation of the Digital Single Market. All in all the project has contributed to shape an EU vision on how the transformative power of ICT can affect the competitiveness of the agro-food chain through the prism of international, national and sectoral efforts. Future sustainability will be ensured by establishing a governance model for the maintenance of the framework and its follow-up, completed by policy recommendations for its mass market adoption.